Byronswell’s mission is to work with children and young people’s charities and to date we have helped grant wishes for hundreds, if not thousands, of seriously ill children. Our first charity partner was Dreams Come True, for which we raised a grand total of £213687.37 since 2008. Our next charity partner was Round Table Children’s Wish, which received from us around £40000 over the course of our partnership. Samuel's Charity is a registered national charity (no. 1164034) that provides toys, treats and useful hospital equipment to children's hospital wards around the UK. The presents give seriously ill children a much-needed break from what is often a painful and scary experience in hospital. Examples of these treats include: video games, toys, free Netflix and TV, craft and sensory equipment, furniture and even electric ride-in cars. The charity also provides medical equipment that can make a big difference to a child's treatment, such as Accuvein handheld scanners to make injections easier and less painful. We began our partnership in November 2017 to provide reliable monthly funding to help support the charity and to increase awareness of the incredible work it does. We distribute charity bags – designed to meet new ASA guidelines – to houses across the UK in licensed council areas. All of the collected items are sorted in our warehouse and sold onto buyers in Eastern Europe who will sell them on to be used again. From house to house collections, £75 made per tonne will be donated back to the charity, and from our textile banks, £120 made per tonne. 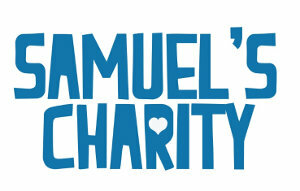 To find out more about Samuel's Charity, please visit their website here. If you have any questions about a house to house/textile bank collection, please see our FAQ page or give us a call on our free collection helpline 0800 084 2757. We have developed a Recycling Code of Best Practice that outlines our duties to the charity and our commitment to ethical and responsible textile collection and recycling. If you need any more information, please give us a call on 0800 084 2757 or email us on admin@byronswell.co.uk. ©2016 BYRONSWELL LIMITED. All Rights Reserved.